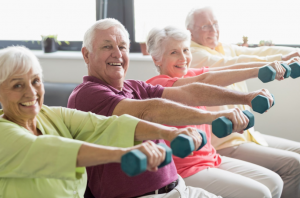 Exercise is extremely important, especially for seniors as it improves both physical and mental health, and reaps long term benefits. It is also important to be mindful of certain factors when exercising, to eliminate unnecessary strain on the body. In order to ensure that you are well prepared for the next time you dive into your exercise routine, we’re sharing 3 helpful reminders for you or a loved one today! Like exercise, a good night’s sleep will help you maintain physical and emotional health. Exercise stresses out the body, so without sleep, your body has no time to repair or recover. Studies have shown that a poor night’s rest will increase your stress hormones and cortisol, which in return, reaps negative effects on your body. In order to maintain a healthy lifestyle that generously reaps long term health benefits, we’d recommend that you take the time to find the perfect balance between your sleeping schedule and exercising schedule. If you’ve ever felt tired or sluggish when exercising, it’s likely because your body is demanding certain nutritional components that your diet is lacking. Believe it or not, diet and nutrition play a crucial role in maintaining a healthy lifestyle! If you or a loved one is in need of more nutritious foods, try incorporating some of the following nutrition dense foods: fruits, vegetables, beans, lentils, nuts, seeds, whole grains or lean protein. Educating yourself on different workouts, and figuring out what works for you and your body is very important. As much as you may want to challenge yourself, your body may not be able to handle the stress. While your ambitious goals are admirable, we would personally recommend not testing your limits when it comes to exercising. Under preparation for a certain exercises could lead to major injuries, or long term consequences. Instead, try experimenting with workouts that are within your comfort zone. Not only is the risk of injury substantially lower when doing so, but you’ll be reaping more benefits from it as well! Remember that exercising is as simple as walking, lifting weights, even dancing! If you are experiencing mobility issues, try researching for exercises that can be done, while sitting in a chair! The next time you exercise, keep our 3 friendly tips in mind, and ensure that you reap all the benefits of exercise to it’s fullest extent! If these suggestions worked for you, be sure to let us know! We’d love to hear from you! Our specialized programs are designed to improve recovery, encourage independence and promote a return to the highest quality of life. For more information contact us today at 925.271.9100 or visit us online.